Torrential rain caused havoc on Stage Two of the Tour de Taiwan; riders battled multiple flat tires, flooding, and crashes on the 137km stage. Despite the craziness of the stage, Team SmartStop's Rob Britton was able to get up the road and into the top 15 for the finish. "From early in the morning until the riders returned back to the race hotel, the rain did not let off making for a wet and miserable day. There was a mix of light rain and torrential downpours throughout the day, which Taiwan very badly needed, however the riders battled constant flooding all day," said Sporting Director, Michael Roecklein. Early into the stage, Eric Marcotte was a part of a four-man move, who escaped out and settled into a steady pace quickly gaining 1:45 on the peloton but never getting over two minutes. Two riders bridged across, forming a group of six and, despite the group's best efforts, they were caught well before the first King of the Mountain Climb of the stage. Back in the peloton the chaos was just starting to happen for Team SmartStop. "While up in the break feeding Eric, Rob suffered a puncture and was missed by neutral support. With help from Zach [Bell], Rob was able to eventually get back in the field, but the two of them burned a few matches in the process." Approaching the first KOM of the stage, a ten-man crash involving Jure Kocjan caused more headaches for Team SmartStop, "It had already been a very hard wet day for all the guys and as we were approaching the first KOM, the team was sitting in a good spot with Jure, Julian [Kyer], Eric and myself present, but when a crash took down Jure and held up Julian and Eric I was the last man standing as we approached 20km to go," said Britton. Roecklein said: "Jure was lucky to avoid major damage but still hit the deck. While on the ground, Jure was kneed in the head by another falling rider and we quickly pulled the plug on his hopes for the day and had him focus on tomorrow by getting him home safe." From there Bell and Kocjan rode easy into the finish together, ensuring they would make time cut on the stage but didn't burn anymore matches than the stage had already taken from them. Forgetting about everything going on behind him, Britton recovered well from the first KOM, survived the slick descent before the summit finish. "There were plenty of attacks on the way up the final climb and when Paddy Bevin (Avanti Racing Team) made his move, it was enough to put me out the back with about 5km to go." "His incident earlier in the day kept him from a top five placing," said Roecklein. "I was able to fight through and only conceded 37 seconds to the winner and keep within striking distance as the race moves forward," said Britton who eventually finished up in 13th on the stage. 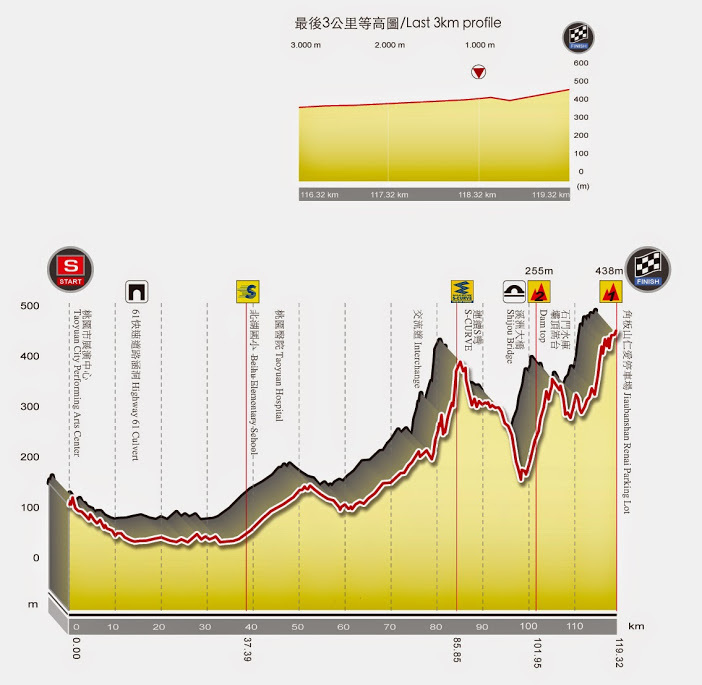 Tomorrow will take the riders 143km in the Changhua Road Race and features two KOMs and one sprint. "Tomorrow has a finish similar to the Manyunk Wall in Philadelphia, which again favors Jure and Eric, so we will be focusing on getting our guys organized to give the team the best chance at a podium or stage win." 11 Darren Lapthorne (Aus) Drapac Professional Cycling all s.t. 20 Amir Zargari (IRI) Pishgaman - Giant Team all s.t. 24 Maarten De Jonge (Ned) Bike Aid all s.t. 29 Burr Ho (HKg) National Team Hongkong s.t. 38 Yuzuru Suzuki (Jpn) Utsunomiya - Blitzen all s.t. 42 Sarawut Sirionnachai (Tha) National Team Thailand s.t. 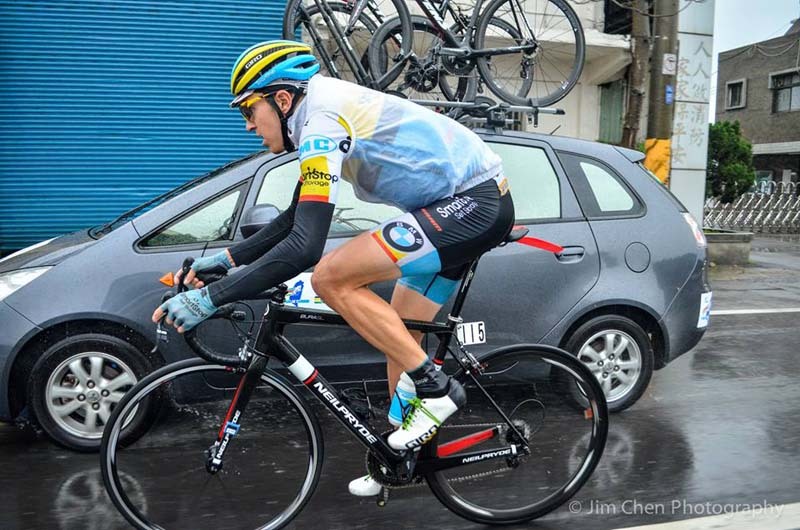 46 Elchin Asadov (Aze) Synergy Baku Cycling Project s.t. 48 Mehdi Sohrabi (IRI) Tabriz Petrochemical Team s.t. 50 Ghader Mizbani Iranagh (IRI) Tabriz Petrochemical Team s.t. 55 Vadim Shaekhov (Uzb) National Team Usbekistan all s.t. 58 James Early (NZl) Team Stölting both s.t. 65 Tan Peng Yuan (Tpe) National Team Taiwan s.t. 73 Nariyuki Masuda (Jpn) Utsunomiya - Blitzen all s.t. 75 Chun Wing Leung (HKg) National Team Hongkong s.t. 78 Ching Ying Mow (HKg) National Team Hongkong s.t. 80 Oscar Pujol Munoz (Esp) Team Ukyo s.t. 84 Zach Bell (Can) Team SmartStop both s.t. 100 Phuchong Sai-Udomsil (Tha) National Team Thailand all s.t. 102 Shotaro Iribe (Jpn) National Team Japan s.t. 20 Amir Kolahdozhagh (IRI) Tabriz Petrochemical Team all s.t. 24 Halvor Tandrevold (Nor) Team Frøy - Oslo all s.t. 27 Kohei Uchima (Jpn) National Team Japan s.t. 29 Jan Oelerich (Ger) Team Stölting s.t. 38 Mark O'Brien (Aus) Avanti Racing Team all s.t. 40 Don Gin Shin (Kor) National Team Südkorea s.t. 46 Thomas Davison (NZl) Avanti Racing Team s.t. 55 Clément Koretzky (Fra) Team Vorarlberg both s.t. 58 James Early (NZl) Team Stölting s.t. 73 Shinri Suzuki (Jpn) Utsunomiya - Blitzen all s.t. 84 Vladimir Zagorodniy (Rus) RTS - Santic Racing Team both s.t. 100 James Glasspool (Aus) Team Novo Nordisk all s.t. 102 Takayuki Abe (Jpn) Utsunomiya - Blitzen s.t.